In the world of flatware there are a lot of options. Just think of flipping through an online storefront. 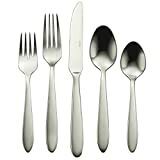 You’ll see stainless steel 18/10 options, stainless steel 18/0 options, flatware with lots of designs, flatware with no designs, flatware that’s ultra light-weight, flatware that’s heavy…the list goes on and on. How are you to pick out the right ones for your house? That’s where we come in. We do all the sorting through the details to come up with our top four picks. These are the options that truly stood out to us and the ones we believe will bring the best value to our readers. Here are our best flatware picks. After assessing our flatware samples, we decided that the Lenox Portola 65-Piece Flatware set was our number one gold pick. There are a lot of reasons why this one came in at the first slot and there were a lot of great sets it had to beat out for the title. Here are the main reasons. First, the Lenox Portola has a complete number of pieces to it. It comes with twelve 5-piece settings. Each setting includes a place fork, a salad fork, a place knife, a place spoon and a small spoon. The fact that there are twelve, a number of pieces beyond what the average user needs, means that you won’t have problems with misplacing them. Inevitably pieces go rogue. Whether its children accidently discarding silverware in the garbage when they clear their plates, or taking utensils to work for lunch and losing them, maintaining full sets is a common issue for households. With this set you get enough of them at a great price to not have to worry about a few pieces going missing. The Lenox Portola set also comes with an additional 5-piece hostess/service setting. Included in this set are 1 sugar spoon, 1 tablespoon, 1 piercing tablespoon, 1 butter knife and 1 cold meat fork. This is an added bonus to complete the set. It also will come in handy when you are having parties and need a larger more functional set to serve with. Some higher-end sets either require you purchase the serving set separately, or they increase the overall cost to account for it. With this set you won’t have to worry about either. Next, we looked at the overall design. The Lenox Portola has a sleek and neat design. Edges are tapered softly on all sides. The handle-ends are slightly wider and heavier. At the edge of each is a design of lined-up subtle dots with a line above and below them. It’s a simple design and very understated. The best thing about it is that it will go perfectly with any other table accoutrements it’s coupled with—runners, linens, decorations, topers, etc. Because of its modest design it isn’t fighting for visual attention. Rather, it is unassumingly pretty and lets you design easily around it. It is comfortable in your hand and easy to get used to; it seems like the weight is perfect. We also looked at the quality of our various flatware contenders. The dishwasher-safe and tarnish-resistant Lenox Portola is made from 18/10 stainless steel. That means they are made of 18% chromium and 10% nickel. 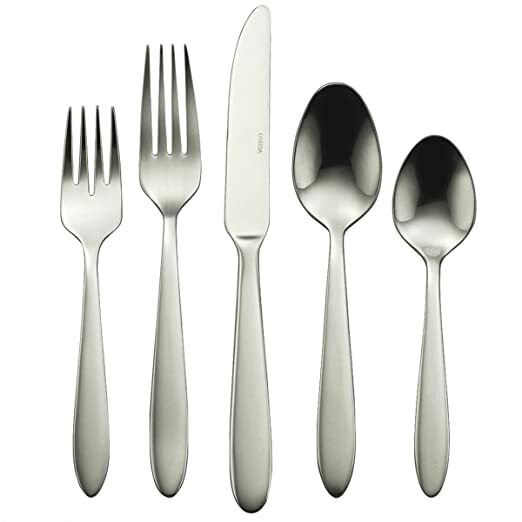 Chromium is what lends flatware its durability. Things like rust resistance and strength are direct results of the amount of chromium in the metals. Nickel gives it the shine and allows non-silver flatware to look like silver flatware. By definition 18/10 means your flatware will be long-lasting and have a fantastic shine to it. This is a huge benefit when you want the flatware to look expensive without the high price tag. An added benefit to the Lenox Portola is that it isn’t two pieces of steel pressed together as is common with some lower-end brands. Rather, this one is constructed from one piece of stainless steel that is stamped to get the design. Quality also included the flatware’s overall finish. Our goal was to find the flatware sets that were the most affordable but also the best quality. Part of that means looking more expensive than it truly is. The Lenox Portola is a stand-out in this category. Roundness of design traditionally means higher-quality. Though you won’t have to pay top-dollar for this one, it will look like you did. Whether you need an everyday table setting for six, or a party setting for ten, this is the perfect selection. It likely can fit all of your dinner needs with ease. Our silver product pick for best flatware is the Oneida Mooncrest 45-piece Flatware Set. It is another pick that is durable, pleasing in design and flexible for any dining table look. If you’re in the market for new flatware definitely give this one a look. When looking at the size of the set, the Oneida Mooncrest has 45-pieces to it. It comes with eight 5-piece settings. 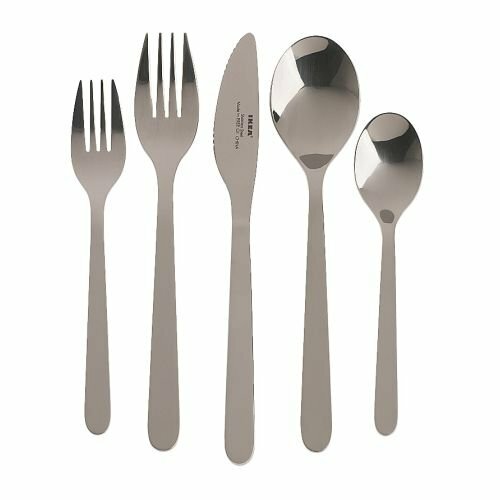 Each set includes a place fork, salad or dessert fork, place spoon, teaspoon and place knife. This is a lower number than our number one pick in terms of pieces, however this set also comes at a lower price point. It still is a great value for the investment dollar. Eight place setting also is still enough to be useful for most households, with a few extra pieces to spare. It also comes with a 5-piece hostess/serving setting. This includes a piercing serving spoon, a large serving spook, a meat fork, a sugar spoon and a butter knife. Each knife in the set has a comfortable grip for ease of use. The design of the Oneida Mooncrest is also simple and understated just like the Lenox Portola. With the Oneida brand, the design is sleek and streamlined. Pieces are blended together in one single piece of steel. There are no printed designs at all. The only thing you will see is the polished silver to accentuate your own designed dinner table. Again- we tried to pick flatware sets that would not try to compete with your own style. These are the perfect accompaniment to any table. Regardless of what your dining room and kitchen is decorated with, the Mooncrest will hold its own without taking over. They are functional and offer sturdy design. If you’re a minimalist, these may be the perfect selection for your house. Holding the flatware is comfortable. The smoothness is a standout feature too. One thing we noticed however is that when you hold them, they are heavier than other normal flatware utensils. This is going to be a personal preference as to what “feels right” in your hand, so we encourage you to test them all out prior to purchasing. In terms of quality, the Oneida Mooncrest is made of 18/0 stainless steel and is dishwasher safe. The 18/0 blend means that it’s 18% chromium and has no nickel in it. Remember that chromium is what makes flatware durable and nickel is what makes it shine. This flatware isn’t going to be as shiny as other options. If you like to polish your silverware to a sparkle, this isn’t the brand for you. To explain further, if a restaurant wants to keep flatware costs down, they choose styles with 18/0 stainless steel alloy. They do this because the flatware will be durable and functional, but whether or not it shines to a sparkle isn’t a high priority for them. If this is you as a homeowner than 18/0 alloy may work. If not, you may automatically want to opt for an 18/10 flatware set. Despite its lack of nickel, the Oneida Mooncrest series makes up for anything it lacks, with its innate durability. Our goal was to find flatware with the highest value for the cost. The Oneida Mooncrest is still a good option. It is a smaller set, but for smaller households this is fine. It also is less costly and comes in as a more functional choice than shiny choice. This is probably the best option for households just starting out. Still, it holds at our second spot pick firmly. Our bronze pick is the J.A. Henckels International 65-piece Alcea Flatware Set. What’s nice about this set is that it looks higher-priced that it really is. But more about that later…let’s look at the various other reasons why we chose this one as our number three top choice. 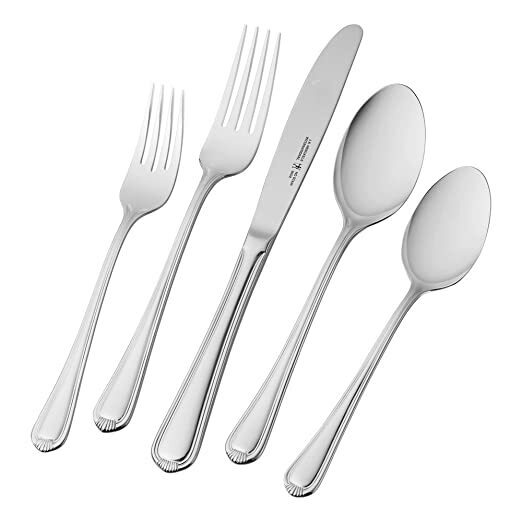 The Alcea flatware set is another complete set with a lot of pieces. It has twelve 5-piece settings like the Lenox Portola. The value of investing in a lot of pieces from the start is that you’ll be able to afford a missing piece or two without having to rush out and replace anything. If you are an avid entertainer, getting flatware with a lot of place settings is also handy. You won’t have to purchase more than one set; you can just get a larger set like this one to do the trick. It also comes with some extra serving utensils. With the set you get a serving fork, serving spoon, slotted serving spook, sugar spoon and butter knife. It’s always good to have the serving utensils as an added presentation bonus and for convenience. The design on the Alcea is very pretty. Each piece has a distinct handle that is lined with an indention its entire length. At the tip of each element of the set is another design of small vertical lines. The knives have the J.A. Henckels brand on them with the company logo. Again, this is a set that has an elegant look that easily puts it into a higher price point category that it really is. If you’re looking to impress but still don’t want to break your bank, these are perfect. They can play well to every day table use or to an elegant dinner party. Something about the look is sophisticated and sleek, despite its highly affordable price tag and that’s always a good thing! The design also feels good in your hand. It’s well balanced and sturdy. These are made of 18/10 stainless steel alloy. Because of this they are tarnish-resistant and will show off a good shine time after time. Like the Oneida Mooncrest, these are also heavier. Not as heavy as the Oneida brand, but heavier nonetheless. Again- this is a personal preference when choosing flatware. We found that despite its girth, the Alcea set was still comfortable and easy to use. Be sure to test them out. Likely even if they are heavier than what you’re used to, you’ll get used to them in no time and use them every day as a result. With the Alcea set, an added bonus is the place knives are serrated and easily can cut through steak without the use of an additional steak knife. This is a convenient add-on feature because when setting the table, you won’t have to pull out steak knives. At the end of dinner you won’t have an extra set of knives to clean either. The fact that the company made their place knives with this added feature solidified their bronze pick status with us. The Alcea set is an outstanding pick and made it to our bronze place in the list of best flatware sets. It is pretty, durable, functional and surprisingly strong. Plus, the set is large and offers you a lot of backup utensils if you’re prone to losing them one by one. Check out the Alcea and you may find the perfect flatware set for you and your family. Making it to our budget pick is the Ikea Fornuft 20-piece Flatware Set. They are presented by the Swedish-giant and it’s evident. The design is sleek and simple. Still, for the cost and quality, it’s a great choice that took the number four spot on our list. As with all Ikea products, the Fornuft offers a decidedly plain design but is durable and functional. The set we looked at is a 20-piece pack. It had four 5-piece place settings that include the desert fork, place fork, place spoon, teaspoon and knife. No- this one doesn’t have the huge piece option some of our higher placing options did, but that doesn’t mean it isn’t worth a look. The Fornuft is great for consumers who aren’t in need of a 65-piece set that includes serving pieces. Like a lot of Ikea’s products, it’s for the market that is still setting up their home- whether it is for a dorm room, college apartment or first-time house. This set is fine for people who aren’t at the point yet where they have lavish dinner parties. It also comes at a great price point and just about anyone can afford the 20-piece set. When it comes to the design, it is minimalist. It is a lot like our second choice Mooncrest, in that it is sleek and smooth. The difference though is that the Fornuft has rounder edges. For example, the place fork and the salad fork both have rounder and wider shapes. They are reminiscent of the spoons in the series but with added tines. They also are much lighter than other options. This isn’t a bad thing, but it may take some getting used to if you are accustomed to heavier utensils. Despite the rounder forks and lighter makeup, these utensils still are easy to use and benefit any household. It also may take some getting used to in terms of the look. If you’re used to the longer tines, sans the rounded middles, it may look odd to you. Again- with time you’ll get used to the different shape and won’t even notice it after a few uses. Another unique feature in the set is the knife that is serrated. You can see the small divots in the knives alongside their cutting edges. Unfortunately, they seem to be purely for the look. Try as you might, they aren’t severe enough to cut through meat. If you are having a steak night, you may want to pull out the set of steak knives for your guests along with the Fornuft. The makeup of the Fornuft set is stainless steel. They are dishwasher safe. The one caution with these utensils though is to always rinse them well after washing. Then dry them off. This is to avoid corrosion or tarnishing. This added step can help to preserve your place settings for as long as possible. It’s always a good idea to get into the habit of drying stainless steel pieces in your kitchen. With the Fornuft, be sure to do it to ensure long life span of your items. In the end, the Fornuft is a good backup bonus pick. Mostly it is because of the great price you can find them at. Again- these are not for the large household, unless you plan on buying multiple packs of them. They are built for smaller homes that aren’t looking for high-end dinnerware just yet. As a bonus budget pick though, they hold up perfectly! We decided that the number of pieces would be a priority we would focus on. Most consumers want to make one buy for a product and not have to make multiple buys. We wanted sets to have adequate pieces to sustain the average household for a long time. Also, design played a big part in our review. Everyone wants stylish and nice-looking things in their homes. As usual, quality would play an important part in the reviews we created. We want to always pick items that will last and give the consumer exactly what they need. Finally, the overall “feel” of each set would be assessed. Here are detailed definitions of what we were looking for in each case. 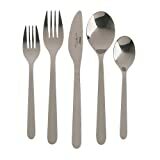 For purchasing flatware we decided that the overall number of pieces a pack included was important. Many households suffer from disappearing utensil syndrome and need a remedy. One way to combat this is to have case packs that account for the disappearances. Rather than having to order multiple case packs or search for single replacements, we wanted to find solutions that offered enough pieces in the first place to minimize the problem, if not eliminate it. Anyone who has had to search around for matching flatware knows the hassle this can be- we want to avoid that for our readers at all costs. When it came to our reviews, if a manufacturer can build a larger pack of items, we gave them a chance. If they were able to match the larger case with a good price, then we took a serious look at their items. Value for cost is a definite concern with all our reviewing and it was looked at with our flatware. We also looked at the overall design of each set of flatware contender. We wanted designs that were easily universal to any household in need of them. Many people decorate their tables for holidays or dinners. We wanted flatware that would look good, without taking over, the table. Though flatware is a necessary part of the dinner table, we didn’t want designs that took over or vied for attention. We also understand that everyone has their own everyday design choices—colonial, country, Spanish or Tuscan. All are distinctly different interior designs. We wanted flatware that could play well to any one of them and blend in flawlessly. Our goal was to find sleek and streamlined designs that would work for just about everyone in need of flatware. We also looked at the extras. Things like whether or not the place knives were serrated and able to cut through meat were noted. So were things like weight of each utensil and whether or not they are heavier/lighter than the standard ones. We also put some time into assessing the “feel” of the pieces. Weight and weight distribution were assessed. We wanted to give our readers a comprehensive guide to understand what it would be like to use each brand and let them make a more informed decision from there. Finally, we also looked at the general finish and quality of the stainless steel alloy. We wanted to make some sense out of “18/10 flatware” versus “18/0 flatware” so that readers would understand their significance. As stated chromium and nickel play important part in the life span and shine of flatware, respectively. For this reason we focused on finding which ones had what combinations of these elements. Knowing that this would be an important determinant of long-term use and customer satisfaction, we focused on getting accurate numbers. We also looked at durability in terms of dish-washer safe utensils. If you’re looking for new flatware there are thousands of options available. Luckily we are here to go through the options for you. We looked at various important considerations like set packs, design and style, and quality to come up with the list of the best flatware sets available. The Lenox Portola took our number one. The Oneida Mooncrest took the number two spot. The Alcea came in at number three. And finally, the Ikea Fornuft got our honorable bonus mention.